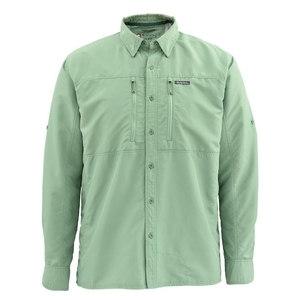 Simms Bugstopper Long Sleeved Shirt. Savvy fishing shirt for fighting harsh sun, humidity, and hatches that bite back. Simms’ BugStopper® long-sleeve blocks sun, dries quick, wicks, and fights swarms thanks to advanced InsectShield® tech. Plaids have a polyester-nylon blend, while solids feature 100% nylon fabric. Two zip-secure chest pockets are fly-box compatible. Articulated elbows enhance mobility. And a sunglass chamois inside the bottom hem keeps optics clear. Traditional fit comes standard.